Need help with your Australia Customs Documentation? To ship unaccompanied Household furniture and effects into Australia there are certain documents you would need to complete. Appleyards of Hull will hand you the ‘B534’ Personal Effects Statement. This will need to be completed and handed back to Appleyards prior to the shipment of your goods. On this form you will need to declare certain information relating to both you and any person who is going to accompany you into Australia. You will also need to declare any item that you may be taking which may be restricted. Appleyards recommend you do not ship Articles manufactured from wildlife, weapons, objectionable material, food stuffs and pine or raw untreated wood. The following items are restricted and can be shipped but you may need to apply for a permit prior to shipment, these include fur, shells, Ivory. All outside items MUST be clean otherwise you may be charged for fumigation upon arrival. This will be an additional charge and payable at destination. Ensure your overseas contact details to include full contact address over in Australia along with any telephone numbers are passed to the International team at Appleyards. You must provide a good copy of the photo page of your passport to include a copy of your visa verification. 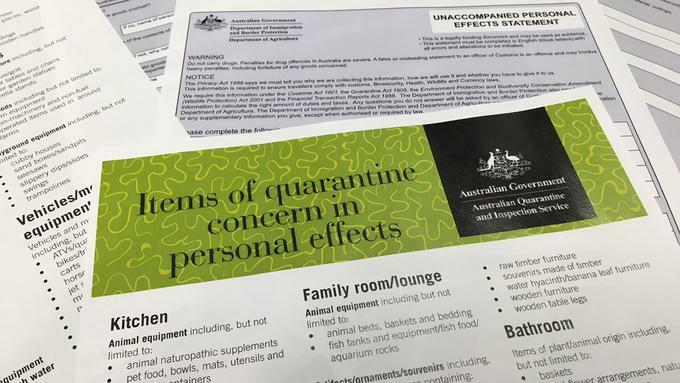 Note we CANNOT ship unaccompanied effects into Australia without having a valid visa in place.